His Highness Sheikh Mohamed bin Zayed Al Nahyan, Crown Prince of Abu Dhabi and Deputy Supreme Commander of the UAE Armed Forces, and President of Egypt Abdul Fatah el-Sisi today reviewed a number of regional and international issues of common interest in light of the robust, brotherly and longstanding relations between the two countries. 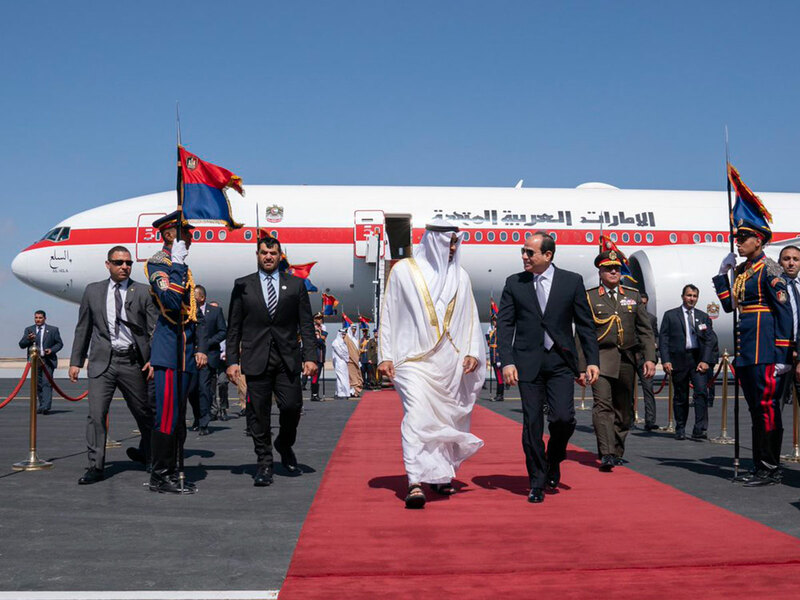 Egyptian President Abdul Fattah Al Sissi received Shaikh Mohammad upon his arrival at the Burg Al Arab airport, where they exchanged friendly talks that reflect the deeply rooted fraternal relations binding the two countries and peoples. This came during a session of talks the two leaders had at Ras El Tin Palace in Alexandria today, where they explored paths of further accelerating cooperation at the political, economic and developmental fronts. Challenges besetting a number of Arab countries and the efforts being made to strengthen pan-Arab cooperation to safeguard regional stability and protect national gains have been thrashed out during the meeting. "The UAE under the leadership of President His Highness Sheikh Khalifa bin Zayed Al Nahyan, is attaching a central importance to consolidating the brotherly relations with Egypt to the higher good of peoples of the region," Sheikh Mohamed said. "UAEs' support for the Arab Republic of Egypt has been a mainstay of the country's foreign policy since late Sheikh Zayed bin Sultan Al Nahyan who was aware of the pivotal role and historical and political leverage of Egypt and was cognizant of the fact that Egypt's stability is fundamental to the security of all Arab nations," Sheikh Mohamed added. "UAE's supportive stance of Egypt continued to strengthen under the leadership of President His Highness Sheikh Khalifa bin Zayed Al Nahyan," Abu Dhabi Crown Prince added, noting the UAE leadership's determination to bolster the developmental drive and stability-oriented efforts being made by Egypt. He expressed support for Egyptian president and his keenness to continue to accelerate bilateral relations at all levels. For his part, the Egyptian president expressed appreciation for the unrelenting support provided by the UAE under President His Highness Sheikh Khalifa for Egypt under all circumstances, reaffirming his country' keenness to continue to grow bilateral relations at all fronts. Both sides called for intensifying regional and international efforts to uproot the scourge of terrorism and extremism and to expose the evil powers that foment terrorism through their media and political outlets. They reiterated their adherence to the promotion of the values of peaceful coexistence and tolerance being the solid basis for regional prosperity, stability and progress. The meeting also resulted in the signing of three Memoranda of Understanding between the two countries to advance cooperation and bolster joint action at various fronts. The first MoU focuses on ensuring integrated management of water resources while the second addresses technical cooperation in the field of standard specifications and technical regulations. They were signed by Dr. Sultan Ahmad Sultan Al Jaber, Minister of State, and Egyptian Minister of Housing, Utilities and Urban Communities Dr Assem al-Jazzar. The third MoU deals with fostering prospects of cooperation in the field of housing, construction and infrastructure and was signed by Dr. Sultan bin Ahmad Al Jaber and Egyptian Minister of Trade and Industry Amr Nassar. Shaikh Mohammad was accompanied by a high-profile delegation that includes Shaikh Nahyan Bin Zayed Al Nahyan, Chairman of the Board of Trustees of the Zayed Bin Sultan Charitable and Humanitarian Foundation, Shaikh Hamed Bin Zayed Al Nahyan, Chief of the Abu Dhabi Crown Prince's Court, Sultan Ahmad Al Jaber, Minister of State, and other senior officials. A number of Egyptian ministers and senior officials attended the meeting as well. The Abu Dhabi Crown Prince arrived in Ras El Tin Palace earlier today accompanied by the Egyptian President where he was welcomed by senior executives.